C# 7.0 (.NET Framework 4.7) introduced ValueTuple, a structure which is a value type representation of the Tuple. 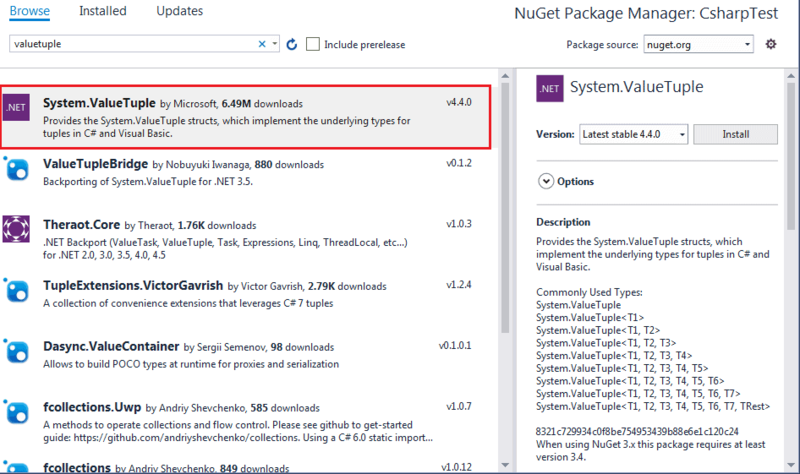 To install the ValueTuple package, right click on the project in the solution explorer and select Manage NuGet Packages... This will open the NuGet Package Manager. Click the Browse tab, search for ValueTuple in the search box and select the System.ValueTuple package, as shown below. It is easy to create and initialize ValueTuple. It can be created and initialized using parentheses () and specifying the values between them. ValueTuple can also be initialized by specifying the type of each element, as shown below. The following is a short way of declaring types for each member. Please notice that we have not used var in the above tuple initialization statement; instead we provided the type of each member values inside the brackets. Tuple requires at least two values. The following is NOT a tuple. Unlike Tuple, a ValueTuple can include more than eight values. We can assign names to ValueTuple properties instead of having the default property names Item1, Item2 and so on. We can also assign member names at the right side with values, as below. Please note that we can provide member names either at the left side or at the right side but not at both side. The left side has precedence over the left side. The following will ignore names at the right side. // PersonId, FName, LName will be ignored. // PersonId, FirstName, LastName will be ignored. It will have the default names: Item1, Item2, Item3. We can also assign variables as member values. The following method returns a ValueTuple. We can also specify different member names for a ValueTuple returned from a method. Individual members of a ValueTuple can be retrieved by deconstructing it. A deconstructing declaration syntax splits a ValueTuple into its parts and assigns those parts individually to fresh variables. We can also use var instead of explicit data type names. ValueTuple also allows "discards" in deconstruction for the members you are not going to use.